Wouldn't it be great to never have to work again? That’s what it’s like when you’re doing something you love - it isn't work, it's fun. Bear Hunt is about turning that dream into reality. Eight simple yet startling insights provide the formula that can lead you towards your goal, starting with helping you to discover what it is that motivates and stimulates you. 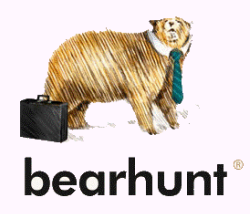 Bear Hunt is your path to discovering a life you’ll love. Just like the family in the children’s story, We’re Going On A Bearhunt, when you are searching for something big, beautiful and frightening you will come up against many obstacles. To achieve a life that you can love you have to stop tinkering around at the edges and have the courage to smash through them. Bear Hunt is about creating the spirit, knowledge, skills, creativity and desire to overcome all barriers to happiness and fulfilment. If you are not living on the edge, then you are taking up too much room. Think of the richest square mile in Britain and your thoughts turn to The City of London or Chelsea. In fact, a small village in Cheshire is home to more millionaires per square mile than anywhere else in Britain. It is a place where one-in-twenty houses sells for more than £1 million, 20% of the residents enjoy a seven-figure income and in an index of ‘poshness’ Alderley Edge scored 136 out of a maximum 137. Goalkeepers have an unusual view of the world, but as an American who played abroad, Brad Friedel's is more unique than most. A highly respected visionary who thinks outside the box, he focused on his game and developing his ideas. Friedel’s incredible journey took him to three World Cup tournaments, spells with foreign clubs, and finally to the top levels of the Premier League. His inspirational story offers a very special perspective of the world of professional soccer. Dietmar "Didi" Hamann offers a warm, personal, and highly entertaining story of his time on Merseyside at a football club which will always have a very special place in his heart. Hamann is a complete one-off—the foreigner with a "Scouse" accent, the German who now plays cricket for his local village team, the overseas footballer turned anglophile who fell deeply in love with the city of Liverpool, its people, and its eponymous football club. The classy midfielder had a long and distinguished playing career, but it was his seven seasons at Anfield that marked him out forever as a true Liverpool legend. His cult status was secured when he came off the bench at half-time during the 2005 Champions League final in Istanbul to inspire his team to a dramatic comeback and spectacular European glory.